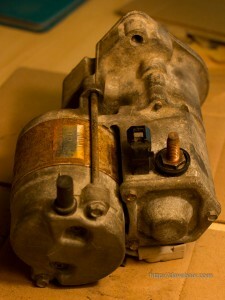 In this vehicle, the starter is mounted at the front of the engine near the center but on the driver side. Here are the steps for taking it out and repairing it. 1. Disconnect negative terminal connector from the battery. 2. Put the parking brake on and lift just the driver side front maybe 5-6 inches, enough to easily get your head and shoulders under the front end and have some room to get at the starter. To do this, I did the lifting using a scissor jack, then supported the vehicle with a jackstand. I left the unloaded but still mostly extended scissor jack in place as backup in case the jackstand failed. 2. Disconnect the control cable from the starter relay (just depress tab in port in connector socket gently, and pull the connector out). 3. Disconnect the big high current cable from below. 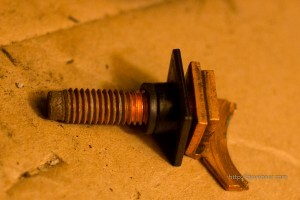 I used a 13mm socket, long variety, with a 3/8″ ratchet + long extension. 4. Remove the two big bolts that attach the starter to the engine. 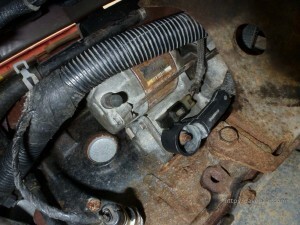 This is perhaps the hardest part because the upper bolt is hard to access. Be patient. 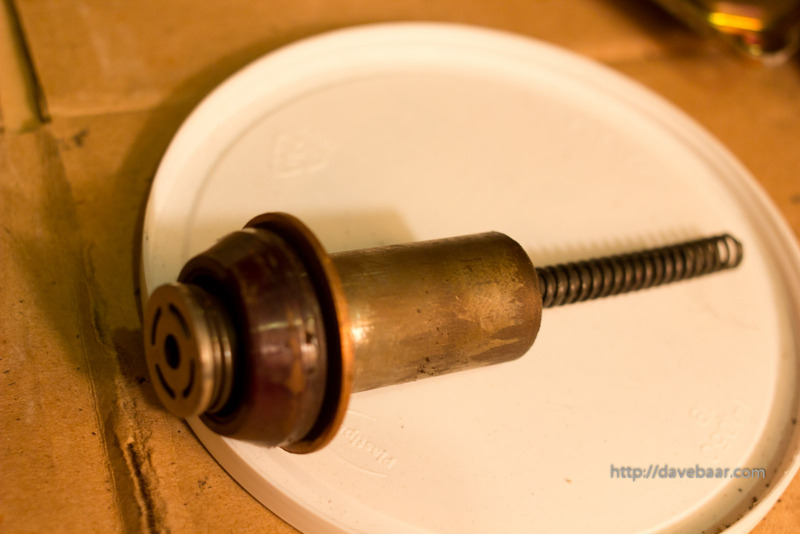 I used a short 15mm socket + 3/8″ ratchet with no extensions and was able to remove both bolts from below. Keep track of the thin spacer/shield plate that goes between motor and engine, and hangs on the positioning dowel on the starter. 5. At this point, working under the front of the vehicle, you should be able to pull the starter out from below. You will likely need to gently push a big cable bundle sideways slightly to get enough clearance. 6. Now, you can take the starter to a workbench and begin the work of replacing the contacts. Here’s the starter on my bench. 7. 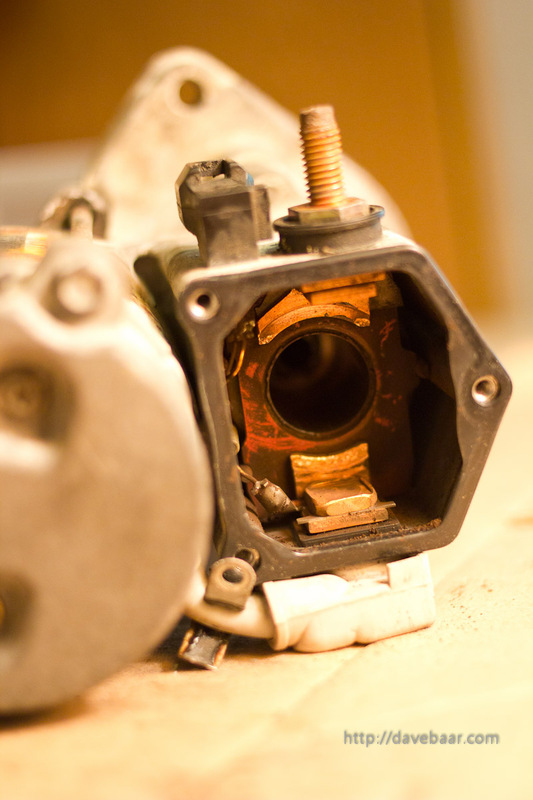 Remove the three small bolts holding down the starter solenoid cover plate. I used a 7mm socket for that. The cover plate should pull off easily. Here it is partially removed. 8. 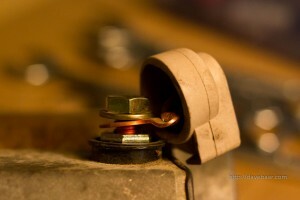 Carefully pull out the solenoid core and the spring concentric with it. Now you’ll be able to see the eroded contacts. Mine looked like this. 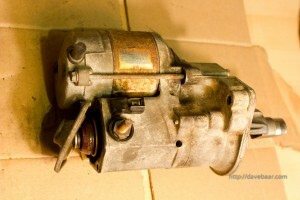 Re-installation in the vehicle is the opposite of removal. Good luck and be careful. Cars are big, powerful, and heavy, and I can take no responsibility for any harm that happens to you, other creatures, or to your vehicle, if you follow my instructions.